Clear Lake Panhellenic President Laurie Vaughn stops for a photo with her mom, Ann Gay, who was president of the sorority alumnae chapter 30 years ago. NO MORE lazy days of summer. Fall is moving in, bringing with it a busy social calendar for the Bay Area. Instead of lounging on the beach, you’ll soon be needing roller skates to just keep up with all our activities – most of which benefit our community and add to our way of life. 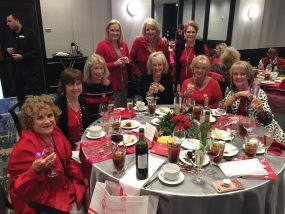 The Bay Oaks Women’s Association and Clear Lake Area Panhellenic kicked off the social season with two long-running events – the BOWA Fall Fashion Show Luncheon and Panhellenic’s Fall Friendship Tea – that have been going on like forever. BAY OAKS Country Club was all abuzz as the style show luncheon got under way with Carol Bobo, Karen Pugh, Sharleen Bullion, Janice Gornto, Lucille Terraso and Sharleen Bullion renewing old friendships after a long, hot summer, along with Marilyn Lunney, Ebby Creden, Carol Short, Ondi Lyon, Pamela Ploss, Emmeline Dodd, Betsy Salbilla, Danele Buehler, Wanda Kelly, Bobbie Moutz, Sharon Phelps, Glenna Crist, Sylvia Resch, Sandy Lantz and Lynette Gregg. Others President Jennifer Simmons welcomed after they signed in the Joy Muniz and Sharon Dillard were Janet Greenwood, Jackie Daley, Rita Johnson, Trisha Gunn, Stacy Bush Davis, Jo Nell Hunter, Gloria Cruz, Kimberly Weathers, Courtney Atchley, Allyson Jackson, Mary Colombo, Rae Sinor, Ann Brady, Gloria Wong and Teresa Albuerne. 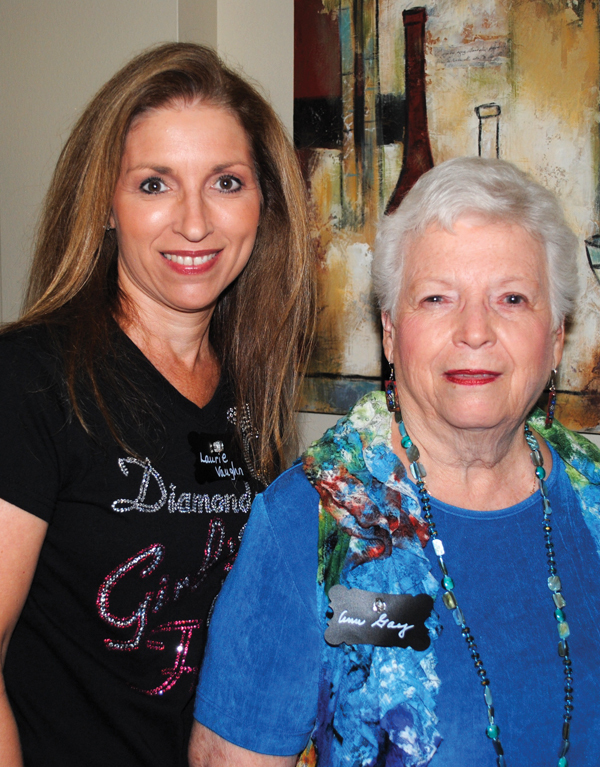 Co-hostesses Jo Nell Hunter, left, and Cathy Osoria prepare to greet the crowd for Clear Lake Panhellenic’s Fall Friendship Tea at the Osoria home. Before long models Lea Bodie, Mary Margaret Smith, Peggy Green, Terri Divine, Rebecca Hensley, Sue Broughton, Judge Holly Williamson, Angela Bivens, Rebecca Hensley, Barbara Dickey and Cambry Rogers showed off the latest fall fashions – much to the delight of Kay Lee Benoit, Margaret Vail, Linda DeMasie, Page Sayers, Patricia Young, Lisa Chaney and Barbara Visser, who also were enjoying some some yummy Chicken Crepes for lunch. CLEAR LAKE Panhellenic members were out in force when Cathy Osoria and Jo Nell Hunter hosted the sorority alumnae organization’s annual Fall Friendship Tea at Cathy’s lovely Bay Oaks home in Clear Lake. Early arrivals included President Laurie Vaughn and her mother, Ann Gay, who also served as president of Panhellenic 30 years ago, and Style Show Chairman Kay Lee Benoit and Co-Chairmen Judie Ferguson and Jo Kat Bruce, who wasted no time lining up help for their big Nov. 1 fashion show luncheon. Plus, Jill Reason, Diane Overman, Ellen King, Peggy Clause, Emmeline Dodd and her granddaughter, Macy Osoria, Judy Raiford, Kim Barker, Kathie Wiley, Sue Ellen Jennings, Lisa O’Brien, Kelli Baliker and Annette Dwyer. Before long, they were joined by Suzanne Streetman, Renee Ditta, Priscilla Ennis, Stacy Bush Davis, Ann Brady¸ Michalyn Ordineaux, Lyla Nettles, Barbara Dickey, Pat McAllister, Sally Jordan, Hazel Harron, Dewanna Norris, Ondi Lyon, Debby Reichert, Ruth Beecher and Kim Krist and the Osoria home was wall-to-wall with pretty women, busy sampling refreshments and talking about their upcoming fashion show luncheon at South Shore Harbour Resort. 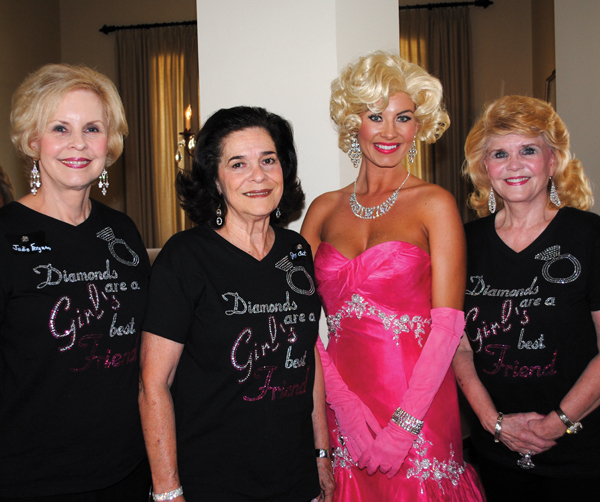 Even Marilyn Monroe was there to remind them that “Diamonds Are A Girl’s Best Friend” and invite them to invite their friends to join the merriment. Nothing quite like Marilyn Monroe to jazz up an event. 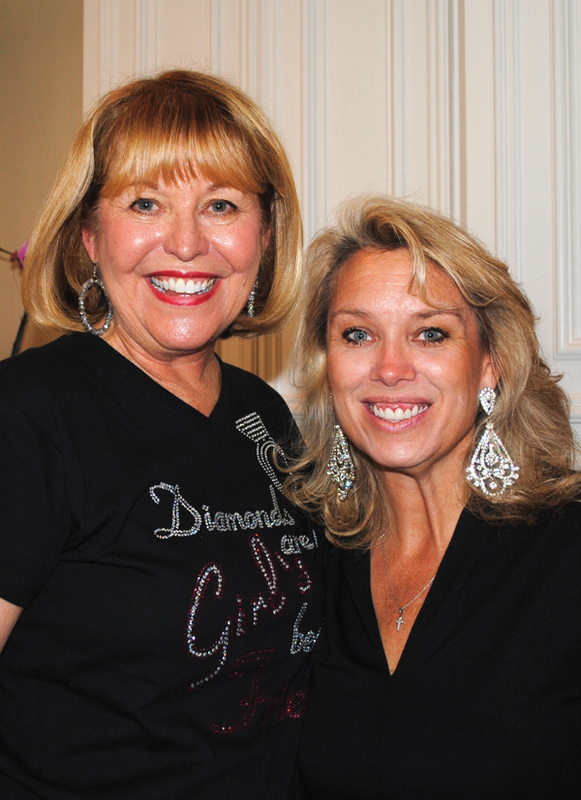 So Panhellenic Fall Fashion Show Chairman Kay Lee Benoit, right, and Co-Chairmen Judie Ferguson and Jo Cat Bruce, from left, inked her for “Diamonds Are A Girl’s Best Friend,” coming up Friday, Nov. 1, at South Shore Harbour Resort and introduced her to the crowd at the Fall Friendship Tea. All proceeds go to Panhellenic’s Crawford-Zbanek Scholarship Foundation, which awards college scholarships to Bay Area women and which has awarded $408,500 in scholarships since 1967. 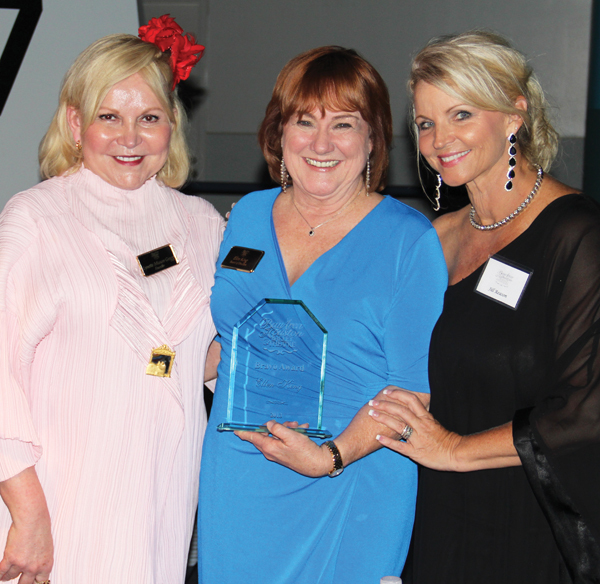 Bay Are Houston Ballet founder Lynette Mason Gregg, left, and Director Emeritus Jill Reason, right, congratulate 2013 Bravo Award winner Ellen King during Kickoff Reception at Bay Oaks Country Club. ELLEN KING, who has chaired the past two ballet balls, was presented the 2013 Bravo Award when the Bay Area Houston Ballet & Theatre kicked off its season with a reception at Bay Oaks Country Club. 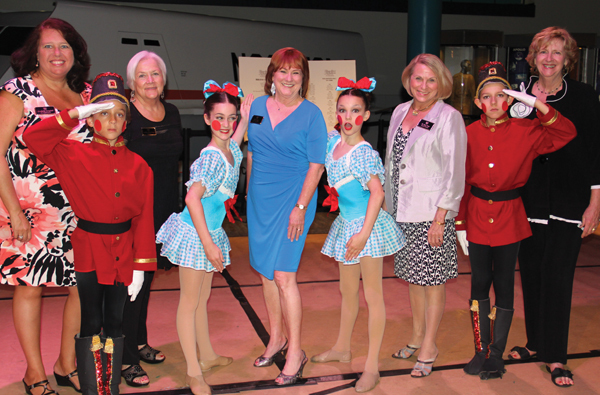 Ballet founder Lynette Mason Gregg and Director Emeritus Jill Reason made the presentation. “Undaunted by the challenge of resurrecting a mammoth and dormant project, she dazzled us with her almost single handed execution of a fun and much needed reboot of our annual major fundraiser,” Lynette told the crowd. Previous recipients were Kimberly DeLape, Sheree Frede, Martha Ferebee, Kippy Caraway, Councilwoman Addie Wiseman, Jim Reinhartsen, Dr. Pat Wilson, Mary Alys Cherry, Pam Culpepper, Bob Mitchell, Matt Wiggins, Tax Assessor Mike Sullivan and Jill Reason. 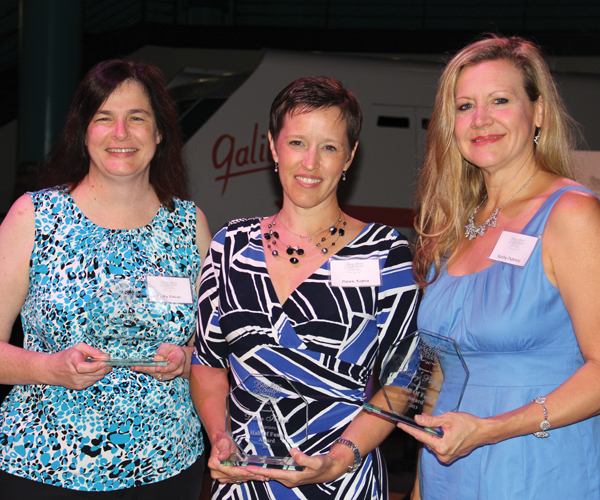 Another highlight of the evening, which featured vignettes from upcoming productions, was the induction of Cathy Pincus, Dawn Kopra and Kathy Pubentz into the BAHBT Volunteer Hall of Fame – a salute to them for all their hard work over the past year. Ballet Board of Directors Kimberly Campbell, Judith Blanchard, Ellen King, Dr. Rosalind Perez and Pam Culpepper visit with Character Dolls Gabe Canepa, Sasha Bennett, Tara McCally and Justin Abel during Kickoff Reception at Bay Oaks Country Club in Clear Lake. BETTER POLISH up your dancing shoes for the weekend of Oct. 4 and 5. Two big events are on the calendar – the Clear Lake Area Chamber Chairman’s Ball Friday, Oct. 4, and the Bay Area Turning Point’s masquerade ball Oct. 5. 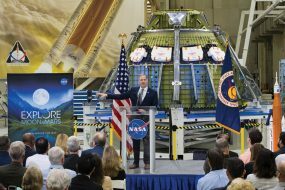 The chamber’s Rockin’ the Red Carpet will start at 6:30 p.m. Friday when guests begin walking down the red carpet at Space Center Houston, where they will honor outgoing Chairman of the Board Mike Furin, My Flooring America vice president, and the retiring chamber directors. Tickets are $95. Black tie suggested. “This evening, filled with great food and good friends, is the perfect way to cap off our chamber year and toast our chamber leaders. You definitely won’t want to miss this exciting celebration!” President Cindy Harreld says, adding that new chamber officers and directors will be introduced. Volunteer Hall of Fame award winners for 2013 Cathy Pincus, Dawn Kopra and Kathy Pubentz, from left, get together for a photo after the presentation. L’ELEGANCE Masquerade, the Turning Point benefit, is from 8 p.m. to midnight at South Shore Harbour Resort with music by the Mambo Jazz Kings, fabulous food stations, blackjack and poker tables, a cash bar and live and silent auctions. Evening or masquerade attire is recommended. “The evening has been planned so that guests have a variety of things to do and not be glued to a chair all evening,” said Diane Savage, BATP president/CEO. “There will not be any speeches or presentations. Guests can choose to dance when they want to, eat when they want to, play poker or blackjack and bid on an array of silent and live auction items,” she added. 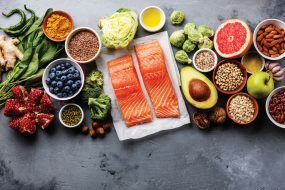 Rather than a sit-down dinner, L’Elegance Masquerade will feature food stations with a variety of hors d’oeuvres, salads, entrees and desserts so that guests can eat as little or as much as they want, when they want.